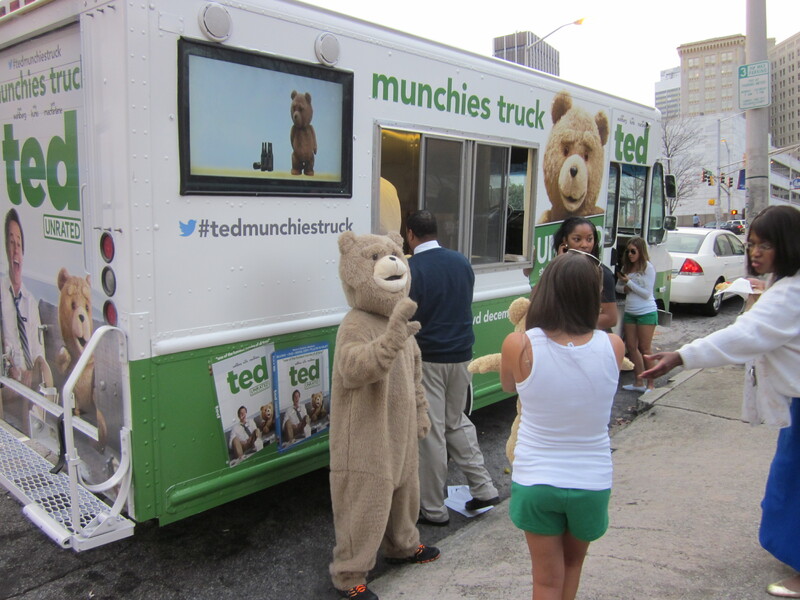 The foul-mouthed, rambunctious, “nothing is off limits” bear Ted made a stop by Georgia State today to give out “munchies” to students on campus and distribute free promotional items for the launch of the film on DVD. the DVD film invited students to “get stuffed” with the anthropomorphic bear on Tuesday. Students dropping by were treated to free pizza, pictures with Ted the bear and free “swag” including stickers, door tags, necklaces and even a few scarves. Flat-screen LED monitors integrated into the Ted truck’s sides displayed the movie for students and passersby to watch as well. Georgia State senior and Hospitality major Aurora Juarez handed out pizza, gave out promotional items, and posed for pictures with students. Promotional manager, Joshua Doueik, donned a full-bear “Ted” suit and waved at students and posed for photographs as well. The advertising agency Victory Marketing and Communications contracted all three for the event. “We wanted to give students a chance to unwind, get some food, and put out the word that Ted is coming to DVD,” Juarez said. Juarez and Doueik were also accompanied by Atlanta Braves Tomahawk Team member Mercedes Montalvo who also passed out pizza and gifts. Ted is the story of a talking teddy bear (voiced and motion-captured by Seth McFarlane) that shares an apartment with now grown-up John Bennett (played by Bretton Manley), who wished Ted to life as a child. The two become good friends, much to the chagrin of John’s girlfriend Lori Collins (played by Mila Kunis). The film is already the highest grossing R-rated comedy film of all time.